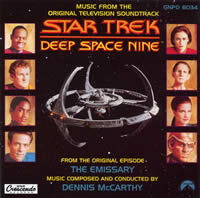 GNP Cresendo presents the original soundtrack to the pilot episode of the STAR TREK Spin-Off Television series STAR TREK DEEP SPACE NINE. Features music by Emmy winning composer Dennis McCarthy. 1. "Star Trek: Deep Space Nine"
17. "Star Trek: Deep Space Nine"